#Earnings This may bode well for the market if NFLX is going to gap this high. #VIXindicator Looking back at all 54 Downside Warnings gives us some data to view our current correction. Below are three charts with the Average Move down on each day of the correction. (I omitted the black swan 2008 financial crisis). Day 1 is the day the Downside Warning fired (at the close). The percentages are how far the LOW of the day on $SPX has moved, as measured from the CLOSE of the day before the warning. So in the current correction (in color), which fired on Oct 5, the day 1 move of -1.1% is the low on Oct 5th, measured from the close on Oct 4th. Day 2 is the low on Monday the 8th, and so on. The first chart includes all 54 corrections. The first three days include all 54, but the 4th day is an average of 53 corrections, since one was only three days long and drops off the list. This only goes to 23 days… the longest correction lasted 165 days. The data here says we are above average so far. Considering the current correction is now 8 days long, I created the second chart, which looks at only those corrections that lasted between 9 and 19 days. The data here says we are above average for short corrections, so this one may end up being a little longer. 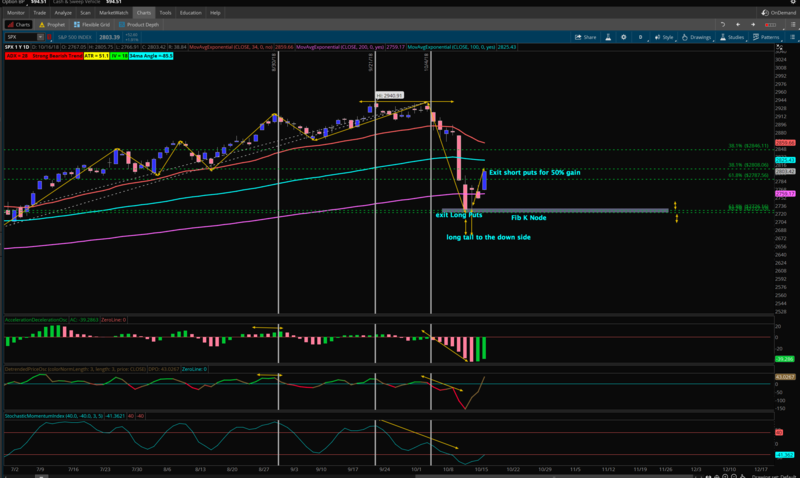 And the third chart is those corrections that were in the 4-8% range on days 4-7, just like our current one. This data suggests we may stay in the current range (down 5% or so) for several days to come). Or it all may mean nothing! But it’s fun to geek out occasionally. Panic buying into the close! All of my long #Pre-Earnings trades (except CAT) are back on the map today, although definitely still weak. $VALE and $AMZN are best, at breakeven…. and that’s with VALE being the only underlying that is NOT up today. LAST TRADE: 3 days to expiration. #earnings #ironcondor NFLX Sold Nov…. Betting NFLX will stay between 300 and 400 after ER today.